A long time ago when i started shaping Surfboards didn’t really have model names, We just made Custom boards. But times changed and about 20 years ago is when i really started to name different Diverse shapes. My everyday shortboard was the “Sprint Model” The next one i made was the “Stealth Model” it was really popular and became a staple board. it was very popular for everyday gold coast surf. 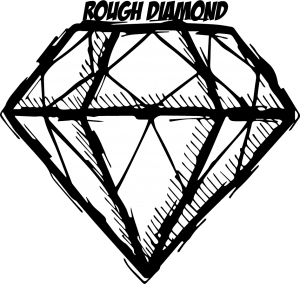 And todays “Rough Diamond” is based on it. Benefiting with refinements from our teams experiences, We moved the flyers to locate them adjacent to the fins so there is a wide range of sweet spots. the Diamond tail shortens the Rail line for turning and keeps length for drive. giving the bottom an impressive double concave thru to channel the water through giving lift, direction and greater stability at speed. Having a Five fin combo allows you to tune the board to your style or the given conditions for the day making this board a truly versatile all round shortboard.